Following news Thursday of a bigger-than-expected dip in U.S. jobs and an unemployment rate increase to 9.5 percent, gold fell toward $930 an ounce, oil plunged to a one-month low and U.S. stocks tumbled. Silver for September delivery declined 35.2 cents, or 2.6 percent, to 13.408 an ounce. Gold for August delivery fell $10.30, or 1.1 percent, to $931.00 an ounce. October platinum lost $11.80, or 1.0 percent, to $1,193.30 an ounce. "The US dollar was seen benefiting from the expected number of jobs lost and a US unemployment rate that is inching ever closer to ten percent," wrote Jon Nadler, senior analyst at Kitco Metals, Inc. "Thus, gold unwound the bulk of yesterday’s gains." The Labor Department reported that employers cut 467,000 jobs last month following a 322,000 fall in May. 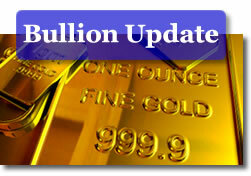 In London bullion, the benchmark gold price was fixed earlier in the day to $929.50 an ounce, a $8.75 decline. Silver dropped 24 cents to $13.41 an ounce. Platinum was fixed $3.00 lower to $1,185.00. Oil plummeted Thursday "as a disappointing jobs report rekindled concerns over when a recovery may begin to take hold," wrote Moming Zhou and Polya Lesova of MarketWatch. New York crude-oil for August delivery fell $2.58, or 3.7 percent, to close at $66.73 a barrel. For more than a week, daily prices at the pump have declined. The national average for unleaded gasoline fell one-tenth of a cent to $2.629 a gallon, according to AAA. The price is 3.8 cents lower than a week ago and 10.40 cents higher than last month. The jobs data weighed heavily on U.S. stocks, with declines across the three major indexes. System issued extended trading hours on the New York Stock Exchange by an extra 15 minutes, pushing the closing bell to 4:15 p.m. ET. In the end, the Dow Jones industrial average tumbled 223.32 points, or 2.63 percent, to close to 8,280.74. The S&P 500 Index fell 26.91 points, or 2.91 percent, to 896.42. The Nasdaq Composite Index declined 49.20 points, or 2.67 percent, to 1,796.52. All U.S. markets are closed Friday for the Independence Day holiday weekend. Check out additional market resources at Live Bullion Spots, the Silver Calculator, U.S. Mint Collector Bullion Price Guide, and the Inflation Calculator.